Species, possibly organensis, South-East Brazil. See "Aechmea caudata, take 3." by Derek Butcher at bottom of this page. Ian Hook 09/02. Ian Hook 10/06. *01/17, Now called Ae. Forget Me Not. Ken Woods, broad leaf variety, 04/05. *01/17, Now called Ae. Forget Me Not. 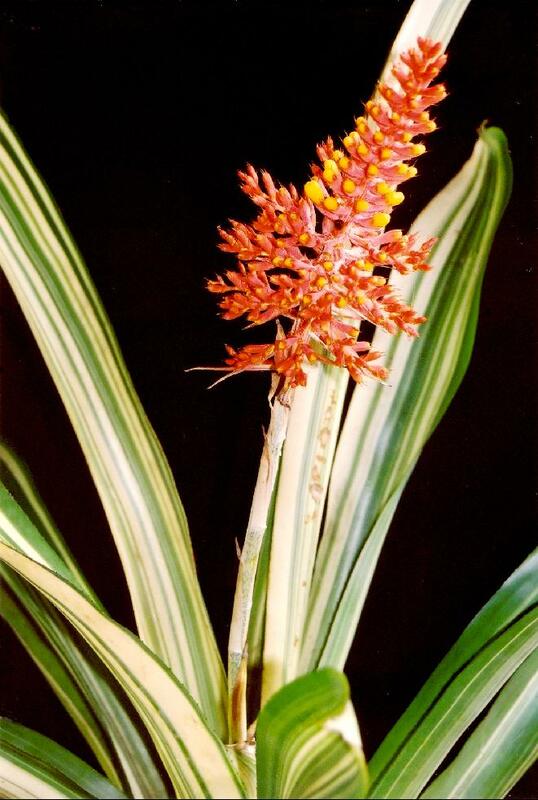 Aechmea caudata by Derek Butcher 10/2009. This all started out when Ross Stenhouse asked me to identify a photo he had of a supposed Aechmea caudata and I couldn’t answer him. Such are the problems of trying to identify a species that cannot be traced back to somewhere in its country of origin. This is what all taxonomists do whereas we, as gardeners have a much more challenging problem if we want to get close to the truth. I say ‘want’ because many are satisfied with the name on the label or are even happy without a label. Or shudder shudder accept identity on Ebay where ‘Caveat Emptor’ (Let the buyer beware) applies. However, the pollen parent is a problem plant. 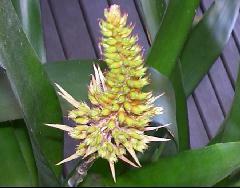 It is usually grown in Australia under the name of Aechmea caudata, but the description of both the plant and the inflorescence differ from those given in the books and keys. The plant, for instance, has large blue-black tips to the leaves. The inflorescence is glabrous but still flocculose. 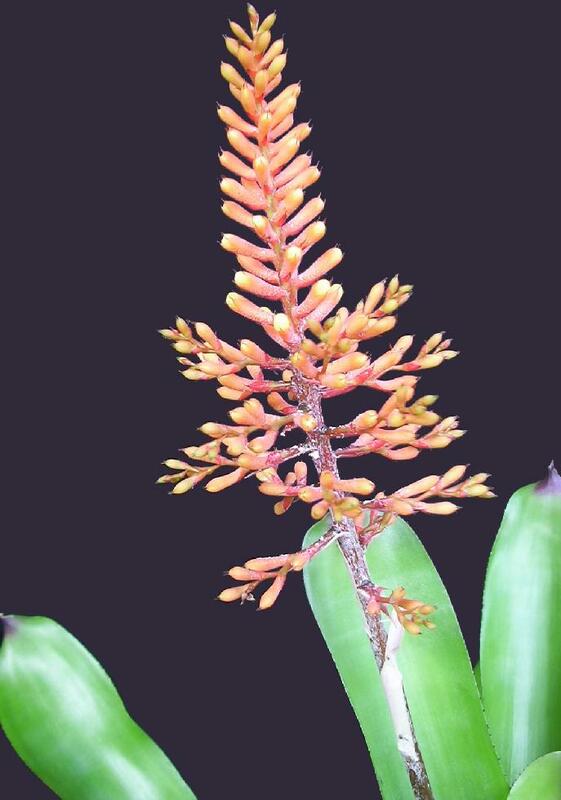 Aechmea caudata - (Free flowering type). This was also smaller than the type I already had. (Later I sent a number of forms to Dr L.B. Smith for identification, as some growers were calling this smaller form by another name. Dr Smith said that this plant came from a wide area and varied somewhat, so there were all forms of Ae. caudata.). This is also good as a hanging basket specimen. The problem here is, what was this ‘other plant’ called and in those days we had very little access to coloured photos. The next step is to give you something to refer to, where we have Aechmea caudata var caudata, var variegata, var. eipperi, and forma albiflora. To my mind var. variegata has never been found in the wild and should have been given a cultivar name! Aechmea caudata var caudata Lindman, Svensk. Akad. Halldl. 24(8): 29, pl. 6, figs. 1-9. Feb 1891. Plant flowering to 9 dm high. Blades ligulate, broadly rounded and apiculate, to 8 cm wide but often much narrower, laxly serrulate with spines less than 1 mm long, sometimes dark toward apex. Scape bracts erect, lanceolate, acute, entire, membranaceous, red, subglabrous, the upper usually much longer than the internodes. Spikes spreading, laxly 4-7-flowered; rhachis slender, strongly geniculate. Flowers sessile, spreading, 18-25 mm long. Ovary sub cylindric, epigynous tube evident, crateriform; placentae extending nearly the full height of the cell; ovules obtuse. Type. Mosen 3242 (holotype, S), Ponta de Taipu, Sao Vicente, Santos, Sao Paulo, Brazil, 20 Apr 1875. Distribution. Saxicolous on coastal ledge to epiphytic in forest, from near sea level to 900 m alt, Espirito Santo to Rio Grande do Sul, Brazil. Aechmea caudata var variegata M. B. Foster, Bromel. Soc. Bull. 3: 47. 1953. Leaf-blades with broad white longitudinal stripes. Type. Foster 2834 (holotype, US), cultivated, from Brazil, June 1955. Habitat: Brasilia sine loco, leg. .AMANDA et MICHAEL BLEHER s. n. fl. in Hort. Halensis 18. 12. 1980, Holotype: WEB 252. Aechmea caudata Lindm. var. eipperi Reitz, Sellowia 17: 41. 1965. Petals pale blue, tip totally blue. Type: S. Catarina. Araquari. legit E. J. Eipper s. nr. (29.8.1962). HBR. Named in honour of E J. Eipper. Ecological Observations- The plant has a similar flower to Aechmea organensis, diverging of this especially for its robustness and the color of the rachis, of the scape bracts and floral, as well as of the ovary, that are red-orange, and everything as in A. organensis and of color red-wine (fide Reitz); flowers with petals clear-blue and strong-blue apex; characteristic and exclusive to the flora of the wet Atlantic forest in Santa Catarina, where it has restricted and inexpressive dispersion. BRAZIL: At the moment only known by the clonotype. Lyman B. Smith & R. J. Downs (1979) as they didn't see the holotype, only copy of the herbarium specimen, suspected it was a variety of Aechmea organensis Wawra. However the clone that supplied the type var eipperi Reitz, has been cultivated by several bromeliad growers, and by me, in Itapema, SC. It varies a lot from Ae. 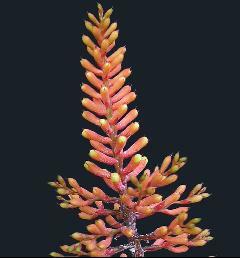 organensis especially in its robustness the color of the rachis, in the scape and floral bracts, as well as the ovary, that are red - orange, and everything else in A. organensis and of color red-wine. The specimens of A. organensis that I collected in São João, Morretes, in Paraná (R. Reitz nrs. 5729 and 5753) were healthy and much smaller than the var. eipperi Reitz, dominating in the color red-purple or red-wine in the inflorescence, except the petals that naturally are blue. You can blame this article on Peter Franklin because you will remember him challenging me in Bromeletter March/April to translate from Portugese to English the details of this rather interesting variety. Reitz maintains this is a blue flowered "caudata", but Lyman Smith suggests this may be synonymous with Ae. organensis. The cynic in me suggests that because Lyman Smith based his key for subgenus Ortgiesia on petal colour a blue coloured "caudata" would not fit! Anyway, I started translating that part in Reitz's book "Bromeliaceas" which I had been asked to do. Reitz clearly believed that his plant was closer to Aechmea caudata than A. organensis. According to Reitz it differed from A. organensis by the strength and colour of the rhachis, the bracts exceeding the flowers and the ovary a healthy reddish orange compared to the wine red of A. organensis. I could not find a full description of this variety although this could be in Sellowia in 1965 when Reitz first described it (It isn’t!). All we really know is that this variety differs from the type A. caudata by having clear blue petals with darker blue tips. I am sure that those who have read so far will be asking themselves why is he telling us this. The keener growers will be pleased to know that this plant is in Australia, AND authenticated. Grace Goode tells me that the plant has a brilliant inflorescence, cone shaped with a wide flat base, deep blue petals with yellow sepals which gradually turn orange. 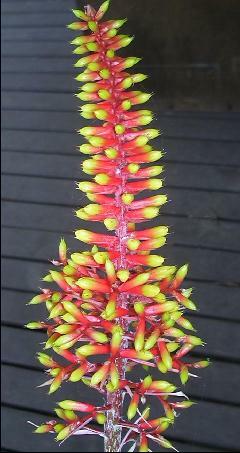 Not an outstanding plant, but the colourful inflorescence makes it worthwhile growing. 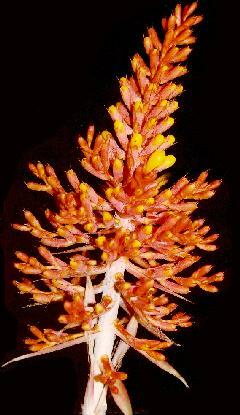 The structure of the inflorescence in no way resembles what we consider to be typical of A. caudata which is branched in the lower portions. The scape is very thick. This last comment tends to equate with Reitz's comment on the strength of the rhachis. Normally rhachis means the stem within the actual inflorescence, and not the flower stem (or scape) but this could be a translation problem. If all the other species in the Ortgiesia group are anything to go by, this should have had species status in the first place. It does seem that we should keep the old name Aechmea caudata v. eipperi despite it being misleading. Harry Luther was involved when Grace first got her plant, and I did write to him seeking clarification because it seemed he disagreed with Lyman Smith's views. He confirmed that Aechmea caudata v. eipperi appears to be an A. caudata with pale blue flowers. It is not A. organensis as far as he could see. BUT A. caudata appears to be a variable mess, maybe several things. The Ortgiesia group is probably the most popular of the aechmeas in Australia, and there are misnamings galore. 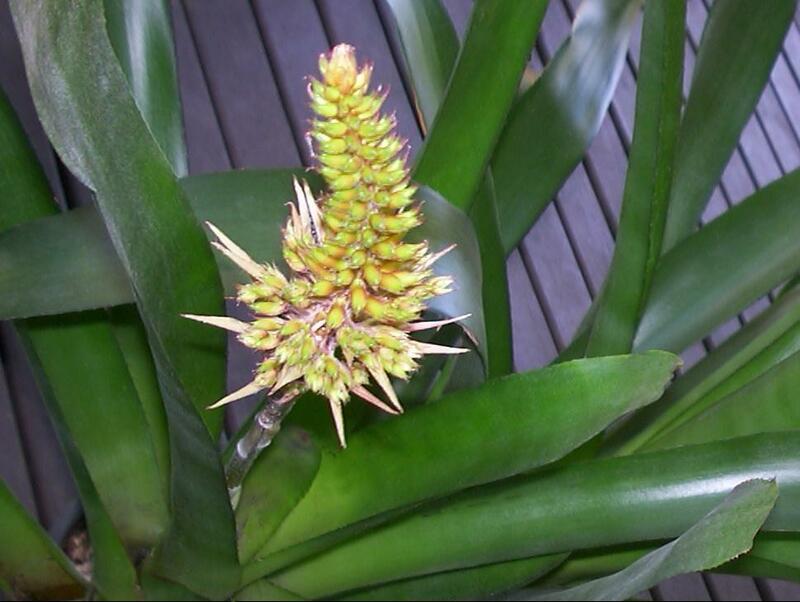 Just one example - what does a true Aechmea gamosepala look like? To give you an idea of what to expect from this species in Australia we have a series of drawings of wild plants to give you an idea of the range and a series of photos to show you how we have interpreted these with plants grown in Australia. First I must warn about growing from seed because this species is one of the many that is promiscuous. Just one example follows. It must be 5 years ago that I wrote in Bromeletter about this plant and shortly after the article I received an offset from Olive Trevor and seed from Grace Goode. The plant flowered and the seed germinated. Grace had got the seed from a plant that Harry Luther had verified was in fact Aechmea caudata var. eipperi. Anyway, photographs of the now flowering offset from Olive were investigated by Peter Franklin and myself and linked in very closely with Grace’s plant that Harry had verified. Peter Franklin and myself’s only gripe was why it was not called Aechmea eipperi in the first place! 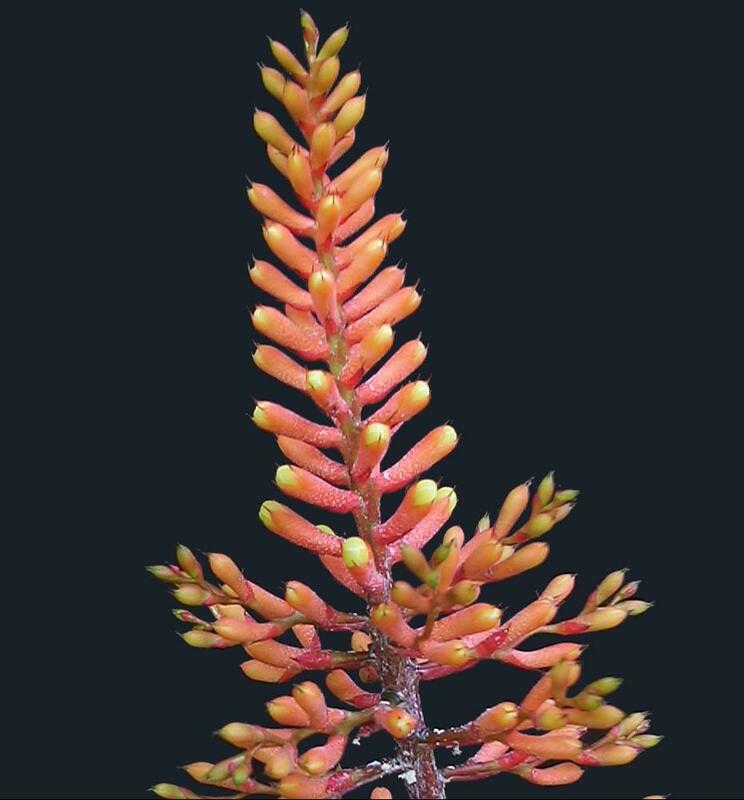 Reitz said the plant looked like an Aechmea caudata but Lyman Smith thought it looked like Aechmea organensis! I digress. This year, Grace’s seedlings flowered and it appears that pollen from an Aechmea recurvata has sneaked into the floral bed and done naughty things. Clearly they are F1 hybrids because they all look alike and I have decided to call them Aechmea ‘Grace’s Blue’. One reason for this is the blue petals and the other reason will make Grace smile because she is known for her jokes! I certainly handed out seedlings to growers around Australia with the comment that “these look a bit Aechmea recurvata - ish to me but tell me what you get at flowering time!” So if you have this plant please change its name. Grace may also have sent seed to others as well as me so beware.